An Indian tech giant is a job-creating engine in the US. Tata Consultancy Services (TCS)—part of India’s largest industrial conglomerate, the Tata Group— employs more than 387,000 consultants in 55 countries. In the year ending in March, TCS added 78,912 people to its workforce, of which 11,584 were hired outside of India, the company said in its annual report. 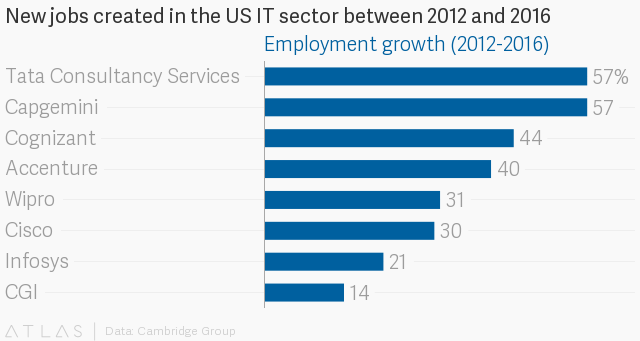 From 2012 to 2016, the IT services and consulting firm ranked among the top two job creators in the American IT services sector, recruiting more than 12,500 workers from the US, according to a study by The Cambridge Group, a Chicago-based consultancy. Its US employee growth rate of 57% during the same five-year period eclipsed all other employers in the tech sector. In 2017, the company expects hiring to “remain on par or exceed prior years’ levels,” according to a press release issued by the company. Each quarter, TCS has more than 800 open positions spanning various roles—software-development engineers, user-experience designers, cloud architects—listed in Texas, California, Ohio, North Carolina, Pennsylvania and New York. “TCS is proud to be a significant employment and talent development force in the US,” said Surya Kant, president of North America, UK and Europe, TCS. In the past three years, the company claims to have invested nearly $3 billion on employment, new innovation labs, extensive STEM education programs as well as academic partnerships and endowments in the US. Not only does TCS recruit from over 75 US college campuses, it has backed STEM education programs too. Since 2009, TCS North America’s free flagship community-engagement program, goIT, claims to have provided upward of 100,000 hours of “high-impact skill building” for students. In 2017, TCS launched “Ignite My Future in School,” a campaign advocating the embedding of computational thinking and problem solving into core subjects such as math, history, science, and humanities. TCS isn’t alone in starting from the ground up—or rather, the school up. As Indian IT companies face the mounting pressure of H-1B reforms—which could tighten restrictions around the six-year work visa for foreign nationals—they are looking to ramp up hiring in the US, where there is a dearth of skilled tech talent. Allowing foreign employees to work remotely, over video conferencing, or from near-shore centers could be viable short-term fixes. But in the long run, companies will have to seek talent in the US. And as long as the demand for tech talent is far outstripping the supply, costs will keep going up. To ensure a consistent flow of talent in the future, other Indian IT giants also have been backing targeted STEM education programs in North America. TCS’ rival Infosys has trained 2,500 teachers and more than 135,000 students. It is also funding the training of over 1,000 public school teachers in computer science this summer. Bengaluru-based Wipro has partnered with universities in Michigan, Texas and Boston to fund fellowship programs to train hundreds of teachers.